This article is part of an ongoing series honoring individuals who have made a difference in the world by applying a GIS solution to challenges or needs within conservation or their communities. Since these unique individuals have been selected for their innovations or special achievements in a particular field, the series is appropriately named GIS Heroes. Esri recognizes Randy Johnson as a GIS hero. Commissioner Randy Johnson of District Five in Hennepin County, Minnesota, recently became the longest serving commissioner in the history of the county, which dates back to 1852. His dedication to making a difference, however, reaches far beyond his local community. As an advocate of GIS technology, Johnson is dedicated to sharing his knowledge and enthusiasm about the power of GIS with his constituents, other elected officials, and members of the federal government. Every time he has an opportunity, Johnson tells others about GIS and how it can improve all areas of government and life in general. "By definition, local governments are place based, and GIS fits into everything a local government does, especially counties," he says. "For more than 10 years, I have had a standing offer: If anyone can find anything that the county does that doesn't use GIS or couldn't be improved by using GIS, I will buy them lunch." So far, he hasn't had to pay up. An employee once challenged him with the question, "I understand how GIS can help in stationing and routing ambulances for hospitals, but once a patient is admitted, what does GIS possibly have to do with that?" Johnson quickly explained that every patient can have a wristband with GPS so staff could always know exactly where every patient is located. "GIS isn't just computerized mapping," he notes. "It's a whole organizing principle." 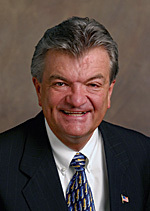 After graduating from the University of Minnesota Law School in 1974, Johnson began his career practicing corporate law and intellectual property law. After a few years, he went to Washington, D.C., to work as the assistant general counsel for the federal election commission. A year into that position, a seat opened up on the Hennepin County Board and he went home to run. Elected in 1978, that win began what has thus far been a 30-year tenure. Motivated by his desire to make a difference in this long-running position, Johnson is also rewarded with variety in his work. "It's a great opportunity for somebody like me who has eclectic interests," he says. Yet, GIS remains one of his constant interests, and that is reflected in Hennepin County's use of GIS. More than 30 years ago, in-house staff developed a GIS called Ulti-Maps that other local governments and some utilities began to use. The county has been a pioneer in using GIS for transportation, and GIS is also used extensively in managing property tax records, as well as ambulance routing and stationing. In addition, Johnson promotes GIS as a resource to support better decision making. "Elected officials don't have time to read all of the material that comes before them. I found out very early that it's not physically possible," he states. "Graphic representation can deliver a message much more effectively than a spreadsheet, so I've been encouraging our staff, as well as county staff throughout the country, to think of GIS as a decision maker's support tool." There was a time, he notes, when people would say, "Here comes Randy with his computer maps again." But Johnson is now finding colleagues are increasingly insistent on seeing maps. This has been especially true as the Hennepin Regional Rail Authority considers combining rail corridors. "Everybody wants to see the alternatives on maps, as well as maps that show potential ridership, potential growth, and potential housing development," he says. "They are beginning to expect to see information in a spatial, map-oriented form, and that's really good." To spread the word about GIS throughout all levels of government, Johnson has taken leadership roles at local and national levels. In 1995, Johnson founded the National Association of Counties' (NACo) GIS subcommittee and is currently its chairman. He later went on to serve as NACo's president. He has been on the board of the Geospatial One-Stop since it began and was the first local member appointed to the Federal Geographic Data Committee. According to Johnson, it is important to have good communication between local and federal government since counties historically manage granular geographic data, such as land records in the United States, and the federal government makes decisions about data standards and related matters. This approach allows all parties to work closely together to facilitate advances in the management of geospatial data, data sharing, and GIS development. Eric Coleman, commissioner, Oakland County, Michigan, and president, NACo, says "When he was president of NACo, Randy Johnson urged counties to become 'global, digital, and sustainable.' He has always been a strong supporter of the use of geospatial technology, and our membership appreciates his continued leadership in the use of GIS to solve business problems. Randy has helped county leaders across America come to appreciate the critical role that GIS plays in service delivery." In line with his work with the federal government, Johnson is a strong voice for the role of GIS in homeland security. "To me, it's very logical that GIS plays an important role in the planning and execution of defense and security initiatives," he comments. "When we had our very unfortunate bridge collapse here in Minneapolis, GIS technology played a role in helping the federal highway transportation commission reconstruct what happened. It also helped us reroute traffic and synchronize our traffic signals." Clearly an evangelist for GIS, Johnson related, "I manage to work GIS into just about every single speech that I give and most conversations that I have with people, because I think it is an organizing principle of life. Spatial thinking is absolutely key to knowing what's going on around you." Webster Guillory, assessor, Orange County, California, says, "Throughout the years, Randy Johnson has championed the implementation of geospatial solutions. Among county-elected officials, he distinguishes himself as a leader who has always understood the great possibilities of this technology." For more information, contact Randy Johnson (e-mail: Randy.Johnson@co.hennepin.mn.us).